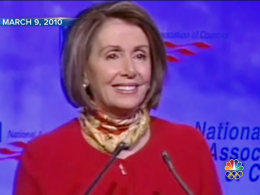 David looks back to 2010 when Congress was working on passage of Affordable Care Act legislation, and examines how Pelosi's remarks foreshadowed the implementation of the policy. >> the big picture on this is it doesn't seem to be working right now. you argued at the time, look, there's a lot of controversy around it, it's politically hot and people still don't understand the good things that are in it. but then you said this in march of 2010 . watch. >> we have to pass the bill so that you can find out what is in it away from the fog of the controversy. >> and hasn't that idea that you have to pass it before you know what's in it, isn't that really the problem, as you look back on it, that there was such a rush to get this done, no republicans voting for it, and now there are unintended effects of this that were foreseen at the time that you couldn't know the impact of it and now it's coming home to roost. >> what i was saying there is, we're the house and the senate, we get a bill, we go to congress, we ping-pong it and then you see what the final product is. however, i stand by what i said there. when people see what is in the bill, they will like it, and they will. while there is a lot of hoop-de-do and do about it, not surprising. i said it would take a great deal to pass this bill. if we go up to the gate and it's locked, we'll unlock the gate. if the fence is too high, we'll pole vault in. if we can't do that, we'll helicopter but we'll get it done. we had to pass the test of the courts, and we did. the first rollout in the first part of the implementation went very smoothly. the website has not worked. that's caused problems people contemplating those changes. it has not turned out to be easy. what happens is what happens at the kitchen table of the american people and how they will have more afford abiliability, more accessibility, better quality care, a healthier nation honoring the founders of our nation, honoring the liberties of a changing policy. >> you consider it a success if 80,000 people are able to get on and sign up. is that acceptable? >> that's just by the end of this month. >> it's not acceptable ongoing, but they're saying with the fixes to the website, they're anticipating that 80% by the december 1 as we go forward. no, it has to be improved upon then. but, again, the measure will be how many more people can sign up? how fewer mistakes and glitches, and again, the shortening of the time for people to get on. but the thing is, this is a big deal . this is a very important pillar of economic and health security for the american people . >> well, all the more important to get it right. why aren't you concerned at this point that this is in grave danger of not being done right?